An exploration site requires an access road and an area of approximately two hectares (five acres) for the rig and associated equipment. A well is drilled in stages, each diameter smaller and deeper than the previous one. During drilling, mud is circulated through the drill string and back to the surface to remove drill cuttings, cool the drill bit and stabilise the wellbore. Once each stage of the well is drilled, high strength steel pipe (casing) is run to the drilled depth and hung from the surface wellhead. Cement is pumped down the casing and up the outside annulus. 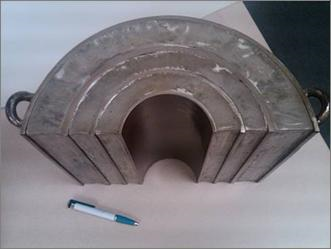 Once the cement has hardened, the casing and cement are pressure tested to confirm there is a protective barrier. Thus, the casing and cement help maintain the control of the well, and provide a multilayer barrier to prevent fluids from escaping into freshwater aquifers. The next stage of drilling continues with a smaller sized bit from the bottom of the cemented steel casing. Shale gas reservoirs usually extend horizontally over many square kilometers, and are vertically very thin by comparison. Horizontal drilling is therefore used to place the borehole in contact with two or more kilometres of reservoir compared to a vertical well which could only contact a much smaller portion of the reservoir. A vertical well is drilled to just a few meters above the shale gas reservoir, normally to a depth of greater than 5,000ft (1,500m). At this depth, and using special drilling equipment above and near the drilling bit (geo-steering, formation logging sensors, and other state-of-the-art technologies), the wellbore is deviated from its vertical plane at a prescribed rate until it is horizontal or nearly horizontal, depending on the planned well design. Drilling continues within the horizontal section (also known as the lateral section) until the planned length of this section is obtained. Typically a single well pad contains 4-6 wells, which are horizontally drilled in different directions. These pad drilling techniques, widely used in the industry, minimise the operational footprint at the surface. If surface constraints exist, production can be concentrated in a smaller number of pads, which could potentially each contain up to 40 wells. 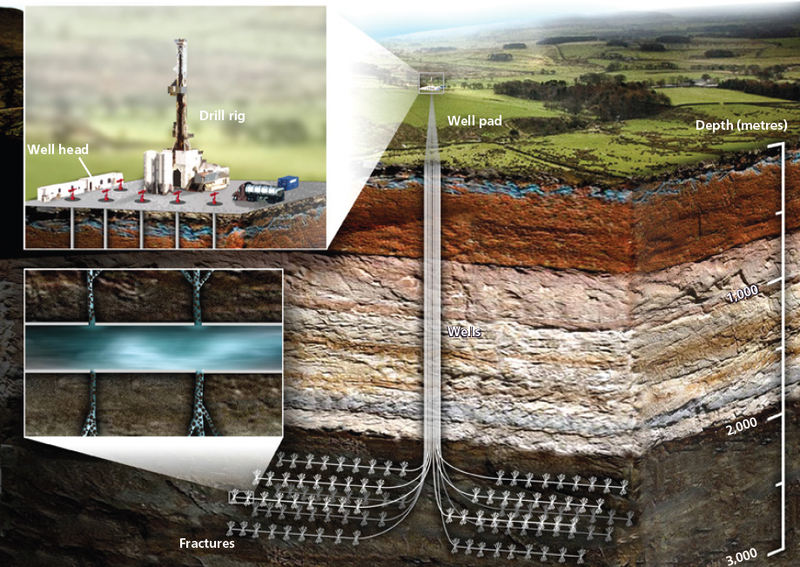 Once the drilling process is completed, the lateral section in contact with the shale reservoir is usually completed with cemented casing, an uncemented liner sleeve, or can be left un-cased (i.e. left as an open hole), depending on the rock properties and well design. The drilling rig normally moves off at this stage and hydraulic fracturing equipment is mobilised. The main components of this equipment include pump trucks, storage and mixing tanks, and a coiled tubing unit. Most of the horizontal portion of the well is perforated in predetermined segments or intervals using a perforating tool or abrasive perforating methods. The perforations extend through the casing several inches into the targeted reservoir zones to provide entry points for the fracturing fluid and proppant. Perforation begins at the bottom of the well and gradually moves backward until the desired portions of the well are perforated. The perforating tool is then removed, and the hydraulic fracturing process starts. A planned volume of fracturing fluid and proppant is pumped at high pressure into each perforated interval, opening up and then propping open induced and natural reservoir fractures. This staged process is repeated for each interval moving backwards through the horizontal portion of the well. Different technologies and techniques are used depending on the characteristics of each shale formation. Once the hydraulic fracturing operation is complete, the well is cleaned out, a production tubing assembly is lowered into the well, and a wellhead is installed. A temporary separator vessel is set up next to the well to separate and measure the volume of fracturing fluid that flows back up the well (flowback fluid), and gas and/or oil from the reservoir. Flowback of any residual proppant is separated in a sand trap upstream of the separator. Flowback fluids are recycled or taken to a licensed treatment plant to yield water suitable for other uses. Depending on country-specific regulations, they could also be injected into deep, depleted hydrocarbon or saline reservoirs via dedicated disposal wells. However, this is prohibited in the EU by the Water Framework Directive (2000/60/EC) and subsequent 2012 Envionmental and Human Health risk assessment. Gas associated with produced water may be flared if no gas transportation pipelines are available. Any associated oil is taken to a licensed oil processing plant (refinery) via pipeline, truck, or rail depending on the available infrastructure in the area. The processes described so far are concerned with shale gas exploratory, appraisal and initial production development operations. Industry expectation is that shale gas wells can produce for up to 20-25 years. Very little surface plant is needed during the production phase. Wells may be restimulated by additional fracturing 4-5 years after initial drilling. In the US, experience has shown that once a well no longer produces at an economic rate, the wellhead is removed, the wellbore is filled with cement to prevent any leakage, and the surface is reclaimed to an agreed condition. Additional details of long term production are outside the scope of this document. More information about long term production and field development in the UK is available from the Office of Unconvential Gas and Oil (OUGO).